i did a post on the new CLEARSNAP product SMOOCH a few weeks ago, and the response has been BIG! HUGE in fact! for those of you who missed it, and are unfamiliar with SMOOCH, it’s a new pearlized ink – think ink you can paint with! and it’s available in 8 lipsmaking colors! the brush makes it REALLY special though, you can really get into teeny-tiny places, it’s firm, not floppy like a regular brush, and the long handle gives great balance and makes it easy to apply! so i have been working on some more projects using SMOOCH, and i’ll be posting them as well as all the directions you need to make them yourself! the papers and stamps are by DAISY BUCKET. if you want to make one of your own, just follow the directions and view the step by step slide show! 1) cut a 4″ X 12″ piece of white cardstock and fold in half to make card. 2) cut a 3″ X 3 1/2″ piece of striped paper and adhere to card. 3) stamp dragonflies, caterpillar and grass on black cardstock using embossing pad. emboss with white embossing powder. 4) color stamps using SMOOCH, then cut out. 5) stamp label on white cardstock using embossing pad, then stamp verse inside label. emboss with black embossing powder. 6) color in label, then cut out. 7) adhere elements to card, using 3D dots to adhere caterpillar and label then add rhinestones to dragonflies. i just LOVE this new product! it really does what it says it will do, and the colors and shimmer are AMAZING! i used BLACK cardstock on this project, just so you could see how well SMOOCH covers, and it only took ONE coat! 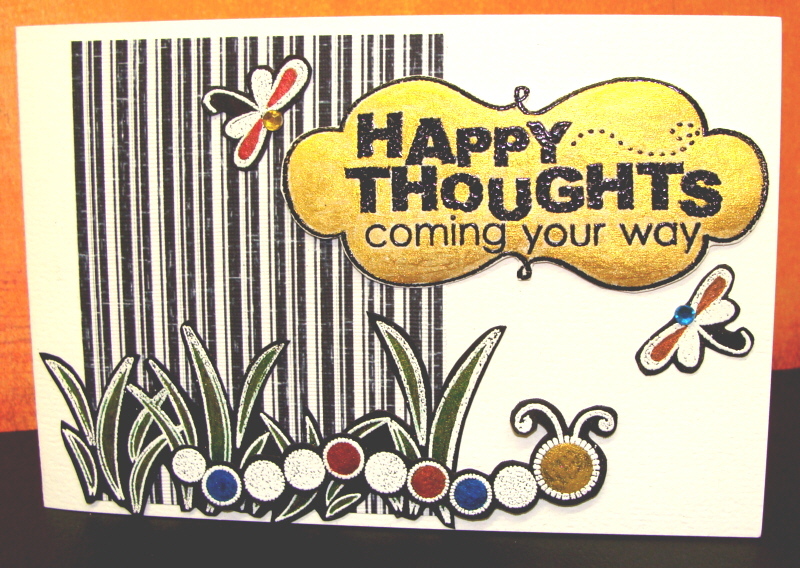 stay tuned for a few more cards and maybe a sneak peek at another project using SMOOCH next week! P.S. : for those of you who are locals, a shipment of SMOOCH should be arriving at SCRAPBOOK 911 on MONDAY! but call first to make sure it DID arrive, and that supplies ARE still available. i did a demo during the retreat, so some of that order is already spoken for! P.S.S. : for you non-locals, SMOOCH is now available online directly from CLEARSNAP! Next Post daisy bucket projects! I ordered Smooch and it is on its way… Whoo Hoo!